My mother-in-law made us this yummy recipe from Taste of Home magazine. Delish! 1. Cook pasta. Cook onion in butter until tender. Stir in flour and gradually add broth. Bring to a boil and cook until thickened. 2. 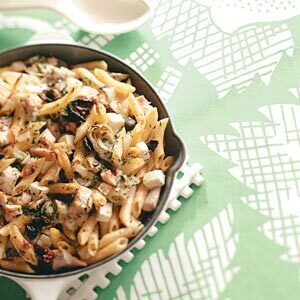 Stir in chicken, artichoke hearts, cheese, tomatoes and olives. 3. Drain pasta and add to the pan. Broil for 5 minutes until golden brown. Sprinkle with parsley. Are these marinated artichoke hearts or regular?